Virtual Reality Projects - ZOO. At ZOO we don’t just use technology for the sake of technology. There must be a relevant reason to apply technology to a client brief. This is very much the case when we approach VR or AR projects. To create brand relevant, immersive and exciting virtual reality experiences. Here are some examples of VR projects that we have created and delivered for Irish Distillers, Red Bull, Coca Cola, Bord Bia and Heineken. Zaconey is a spirit born of the 1950s Coney Island in the US. At the heart of Coney Island is its fun fair. To help launch Zaconey to the Irish market we created a unique on trade experience that truly immersed people in the excitement of the new brand. We created a virtual roller coaster ride – the Zaconey Coaster. The Zaconey Coaster travelled to over 50 pubs around the country. Last Christmas Coca Cola ran and instore promotion with SuperValu and the Odeon cinemas. When people purchased a Coke they were offered a ride to the North Pole in Santa’s sleigh. People climbed aboard Santa’s sleigh put on the virtual reality headset and were taken on a magical ride that brought them over mountains, through tunnels and under a rock fall until they finally arrived at the North Pole where they witnessed a fireworks display beside the iconic Christmas Coca Cola trucks. Origin Green is an event organised by Bord Bia that involves food buyers from around the world visiting Dublin to meet Irish food and drink producers. Visitors trips tend to be brief with 48 hours packed with meetings and seminars. As these visits are short Bord Bia wanted a way to transport people to Irish Dairy and Beef farms to showcase the natural environment and methods of food production. 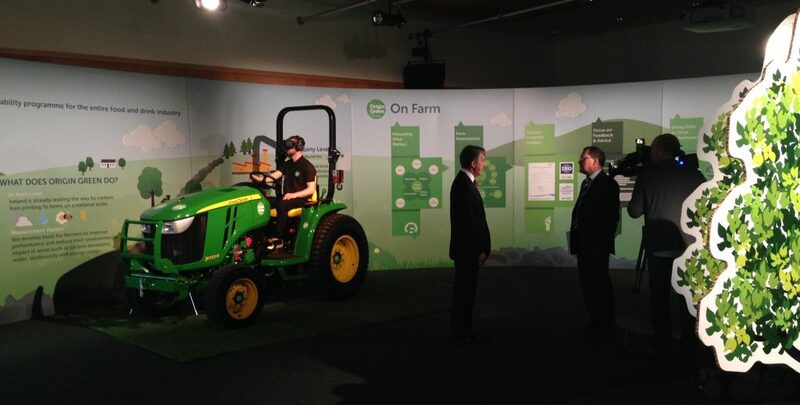 To do so we created a virtual reality video tour of dairy and beef farms in Wicklow and Wexford. People climbed aboard a tractor, put on the headset and were transported to fields where they walked amongst the cattle and visited the dairy parlour. The Heineken Brewery in Cork is a working brewery. This means visitor access is extremely restricted. The team in Heineken wanted a way to bring both members of the public and the trade into the heart of the brewery. To do this we created a virtual reality tour of the brewery with Master Brewer PJ. Tierney. Don’t fancy careering down a steep hill in a homemade soap box car? No. Well that’s where stepped into help! Working with the team in Red Bull we recorded 360 degree video from a soap box derby competitor as it sped down a hill, dodged hay bails and jumped jumps. We pieced all the footage together to create an experience that allowed people to feel the thrills and spills of the soap box derby for themselves. Can you picture yourself walking to the edge of a diving board 83 feet above the sea? Now you’re at the edge take a deep breath look down and jump! That’s exactly the experience we designed for the Red Bull Cliff Diving competition that took place on Inis Mor in the West of Ireland. We created the whole environment and experience in Unity 3D. The results were amazing and scary for some! The experience travelled across the world to other Red Bull events in the US, Italy and Columbia.